Akumal is a small beach-front tourist resort community in Mexico, 100 km (62 mi) south of Cancún, between the towns of Playa del Carmen and Tulum. It is located on Akumal Bay and Half Moon Bay on the site of a former coconut plantation in Tulum Municipality in the state of Quintana Roo, and is part of the Riviera Maya area. The 2010 census showed a population of 1,310 inhabitants. Akumal is famous as a destination for snorkeling, where visitors can swim with endangered green sea turtles, who visit the shallow bay to feed on sea grass. The popularity of snorkeling has put environmental pressure on the fragile habitat. 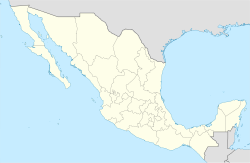 The town was officially founded in 1958 as a community for scuba divers by Pablo Bush Romero—a Mexican businessman, diver, writer, historian, and archaeologist. Pablo Bush's family still owns a portion of Akumal, including the hotel Hotel Club Akumal Caribe. Akumal is also home to ONDARTE International Artist Residency. On March 7, 2016, Akumal Bay was declared a marine refuge to protect the threatened turtle population. ^ "Swimming with Turtles in Akumal, Mexico". Anna Everywhere. Retrieved 22 December 2017. ^ Russell, Paul Sánchez-Navarro (20 Feb 2016). "Akumal suffering from unsustainable growth". Mexico News Daily. Retrieved 22 December 2017. ^ "ACUERDO por el que se establece con el nombre de Bahía de Akumal el área de refugio para la protección de las especies que se indican, la porción marina que se señala en el Estado de Quintana Roo". Diario Oficial de la Federacion. Retrieved 22 December 2017. ^ "Akumal Bay Marine Refuge for protected species declared". Centro Ecológico Akumal. Retrieved 22 December 2017. Wikivoyage has a travel guide for Akumal. This page was last edited on 7 March 2019, at 19:52 (UTC).